Comprises mainly of minutes of shareholders' and directors' meetings, but also includes lithograph and ink sketches of the workings. 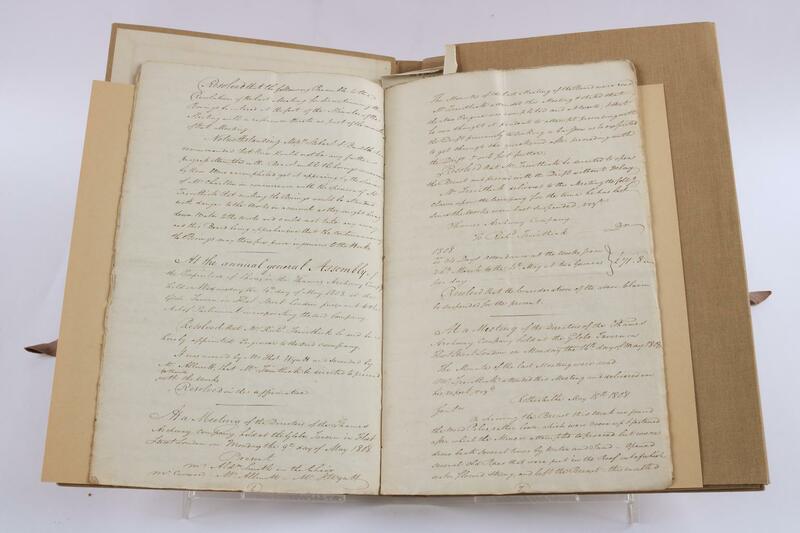 Hand-written minutes of Special General Meeting of Shareholders of Thames Archway held 24 December 1807 (10p. ); Printed minutes of Meeting of Directors of Thames Archway held 12 April 1808 (4p. ); Printed minutes of Annual General Meeting of Shareholders of Thames Archway held on 4 May 1808; Notice of Progress and State of the Tunnel under the Thames (2p.) dated 30 March 1809 (2 copies); Canvas-backed Section of the River, with the shaft and driftway (86 x 29 cm); Thames Archway Share Transfer Agreement (2p.) between Robert Dickinson and Richard Trevithick dated 20 April 1809; Plans and Descriptions of the Tunnel (143 x 21.5 cm) with coloured section of the planned tunnel.